These TIFF images are not maintained for Notices to Mariners (NTMs) and are NOT to be used for NAVIGATION. The images provided may not be current and do not replace the New Zealand official nautical charts corrected for NTMs. These images are not designed to meet the requirements of maritime navigation at sea. 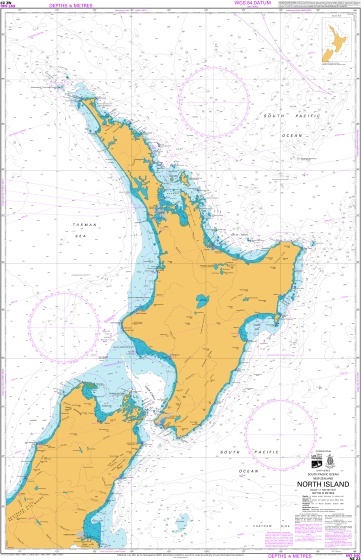 In the interests of good seamanship and safety of navigation, all craft navigating in New Zealand waters should purchase official New Zealand nautical charts for their intended voyage from a chart retailer or download the Official Raster Navigational Charts from LINZ’ website. LINZ publishes Annual and Fortnightly New Zealand NTMs to advise mariners of matters affecting navigational safety. This information should be used in conjunction with official navigational charts. Crown copyright ©. All data and other material produced by Land Information New Zealand (LINZ) constitutes Crown copyright administered by LINZ. The TIFF images are licensed under the Creative Commons Attribution 4.0 International licence. In essence you are free to copy, distribute, and adapt the work, as long as you attribute the work to LINZ and abide by the other licence terms. From 1 March 2019 Chart TIFF images will be refreshed with updates every 6 months. I have read and agree to the Caution and Crown Copyright above. Temporary or preliminary notices currently affecting this chart. Please note that no departmental or governmental emblem, logo, or coat of arms may be used in any way which infringes any provision of the Flags, Emblems, and Names Protection Act 1981 or would infringe such provision if the relevant use occurred within New Zealand. Attribution to LINZ should be in written form and not by reproduction of any such emblem, logo, or coat of arms. Data viewed or downloaded from this web site is not equivalent to or a replacement for the Official Charts, Notices to Mariners, Tide Table, Light List and Nautical Almanac as specified in Maritime Rules Part 25 Nautical Charts and Publications (pursuant to Section 36 of the Maritime Transport Act 1994).